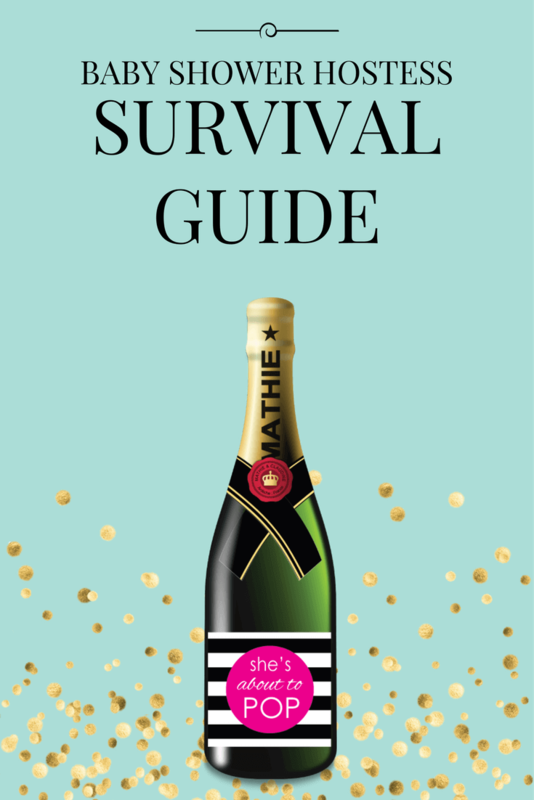 If you are looking to take your baby shower planning to the next level, we have created an amazingly helpful Survival Guide filled with tons of printable goodies and fun ideas! We bundled the cutest, most requested ideas from our website and created printable water bottle labels, favor tags, labels, activities and more! By the time we are done with you, you will be all set to host the perfect (low-cost) baby shower! The baby shower hostess survival guide is bursting at the seams with popular baby shower ideas, printable decorations, 17 best-selling games, scrumptious recipes and so much more! 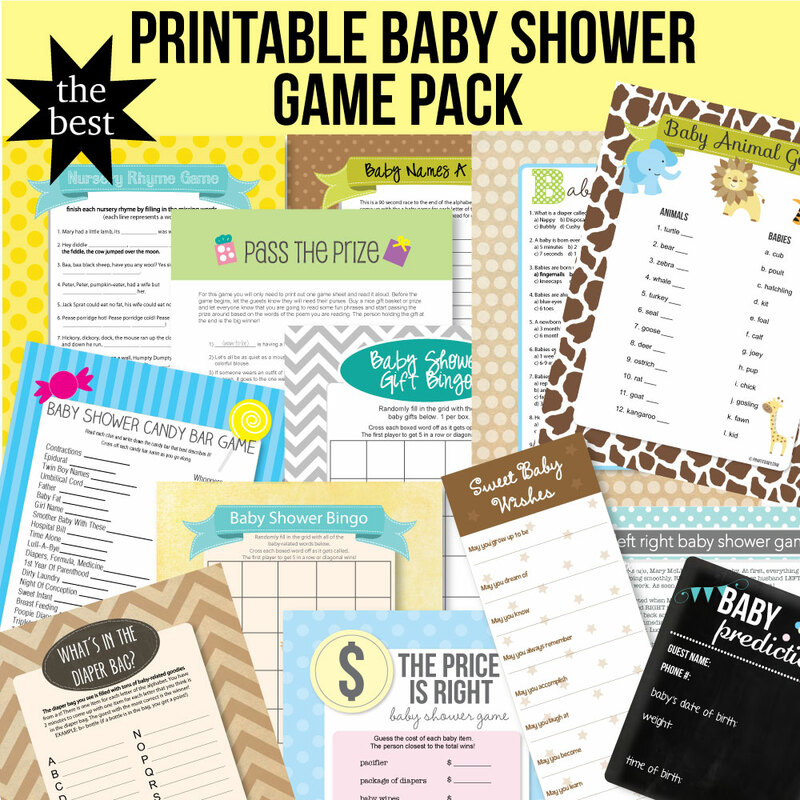 17 Printable Games: You can cross baby shower games off of your to-do list - we have included our mega pack of best-selling, printable baby shower games - all which will make your planning so much easier! Instant access. No waiting. 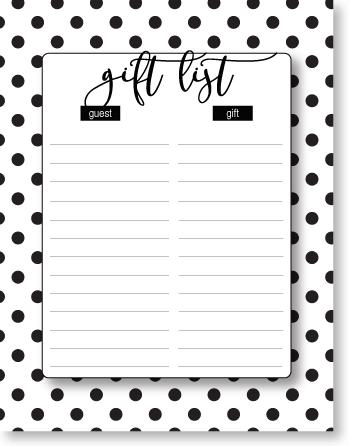 A printable, 8.5x11" gift tracker list to keep track of all of the baby shower gifts and who brought them. This makes writing thank you cards a cinch! And... It is so much fun to tuck this away in the baby book and look at it years later! Print off as many as you need. Comes in black and white polka dot. "Books For Baby" cards are the latest trend in baby showers! They are the perfect way to stock the baby's library with classic books. One small request, we hope it's not hard, please bring a book instead of a card. Whether Cat In The Hat, Or Winnie The Pooh, your book will be cherished, well-loved or brand new. Pick any book, whichever you choose, and sign the inside cover with a special note from you! Each card measures 2.25 x 3.5" and comes in yellow, blue, pink and teal - to match any theme. Print onto white cardstock. 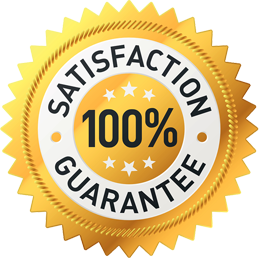 You can print unlimited copies. This is a sweet way for guests to give the baby their well wishes and advice. 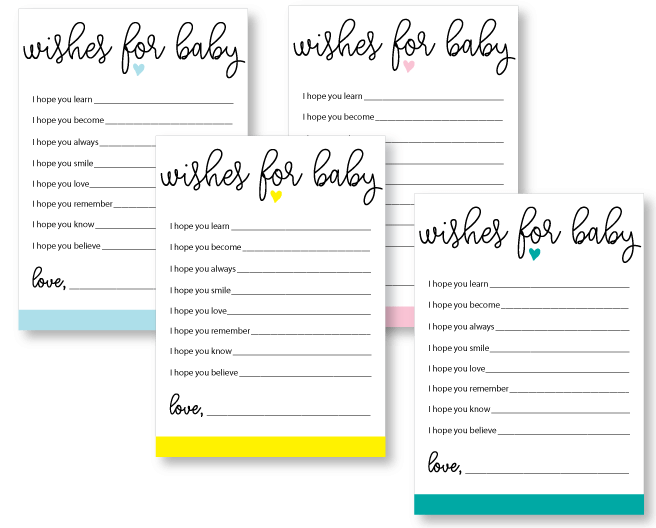 Tuck the "Wishes For Baby" cards in the baby book for years of cherished memories. Cards measure 5 x 7" and you can print as many cards as you need. Pink, yellow, blue and teal cards are included. These mini champagne labels make the perfect baby shower favors and you can jazz them up by tying a bow and cute straw to each one. The label colors you will receive are teal, yellow, pink and blue and they measure 3" x 2". 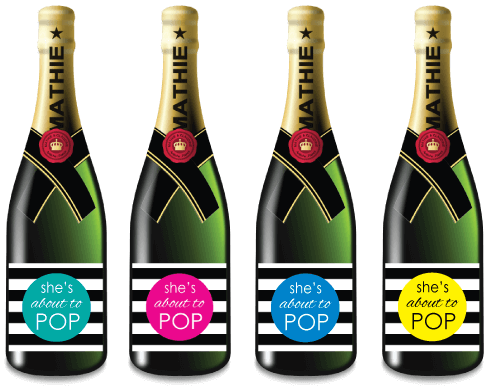 Print onto sticker paper (a full label sheet,) cut out and apply to 175 ml mini champagne bottles. Tuck a diaper raffle card into each invitation to let guests know they can bring a package of diapers if they would like to be entered into a diaper raffle. This is a wonderful way for the mom-to-be to stock up on diapers, and it gets the guests excited to win a prize! The cards measure 2.25 x 3.5" - come in pink, yellow, blue and teal - and you can print unlimited copies. The wording on each card is: Bring this ticket and a pack of diapers in any size - for a chance to win a prize. You can customize these favor tags with any wording you would like (the "Thanks" part cannot be changed.) Add to favors and prizes! Colors included: pink, blue, teal and yellow. Tags measure 2 x 3" and you can print unlimited copies. Champagne Favor Idea: add the tags to the mini champagne favors (above) with the wording: "Baby ____ is almost here! When you hear the news, open your bottle and give a cheer!" Hershey's Kiss Favor Idea: print off the candy kiss labels (below) add to the bottom of Hershey's Kisses, bundle up the Kisses in a cellophane bag, add a cute bow, place the bags in the paper treat cones (below) and add a favor tag that says "Kisses From Baby!" Hand these cuties out as baby shower favors, or place in candy dishes on the tables at the baby shower. Come in pink, yellow, blue and teal - print as many as you need! Turn ordinary water bottle labels into festive decor by adding these printable baby shower water bottle labels. Print, trim, add to water bottles and you're all set! Come in yellow, pink, blue and teal. Print unlimited copies. 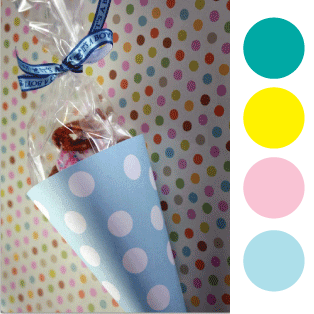 These treat cones are so easy to assemble and they make the cutest favors or snack holders! My favorite way to use them at a party is to have them next to a candy station - where guests can scoop assorted candies into their cones! Come in pink, blue, teal and yellow. 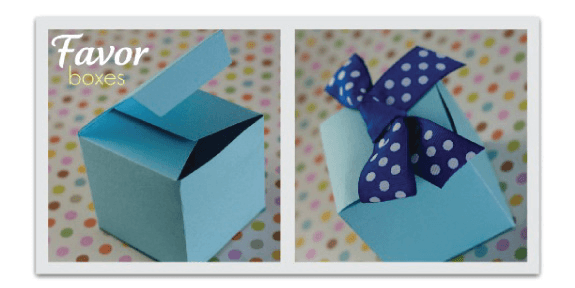 Last but definitely not least is the 6 page ebook that is overflowing with scrumptious recipes, popular decorating ideas and fun templates - such as the favor boxes above! All of your worries taken away in an instant! No more activities to plan, no more menu planning to worry about, favors will be taken care of! Your stress will melt away! Your items with be emailed to you as soon as you place your order - AND ... you get to keep everything forever - so you can print off tags, labels, etc, anytime you have a baby shower!